Babies born with these anomalies have a deficiency of the atrial septum, ventricular septum, and/or abnormalities of the atrio-ventricular (AV) valves. In partial AV canal defect, there is absence of the septum primum and usually a cleft in the anterior mitral leaflet. This anomaly is synonymous with primum atrial septal defect. The intermediate form of AV canal encompasses a primum atrial septal defect, ventricular septal defect usually in the inlet position, and usually a cleft mitral valve. The annulus between tricuspid and mitral valves is intact. 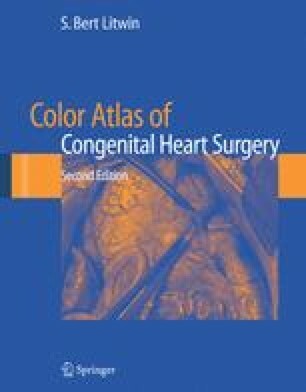 In complete AV canal, the primum atrial septal defect is in continuity with a high ventricular septal defect because there is no annular continuity of mitral and tricuspid valves. This results in a single intracardiac AV valve that functions as both mitral and tricuspid valves. All patients have a significant left-to-right intracardiac shunt and in the presence of complete AV canal there is always severe pulmonary hypertension with or without AV valve regurgitation. Early surgery is necessary because of congestive heart failure and, in the presence of pulmonary artery hypertension, to avoid early development of pulmonary vascular obstructive disease.